New York Times and USA Today bestselling author S.E. 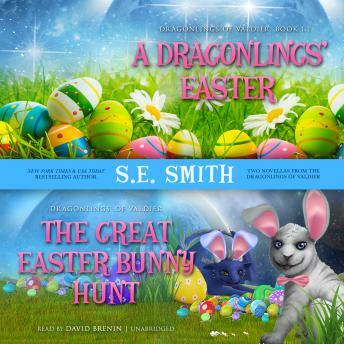 Smith presents two heartwarming holiday stories that will transport listeners out of this world.A Dragonling's EasterWhen Abby creates a set of Easter eggs for each Dragonling, she has no idea she is about to start a new tradition on Valdier. What happens when the men and the Dragonlings take the hunt for the colorful eggs to heart? Laughter and a whole lot of crispy eggs!The Great Easter Bunny HuntAlien eggs can only mean one thing-an adventure! A pile of unusual eggs leads to an exciting Easter egg hunt for the kids and the adults alike in this delightful holiday tale. The children must work together to recover Jabir's coveted eggs after the Great Easter Bunny is caught taking them away. Can the Dragonlings and their besties save the day?